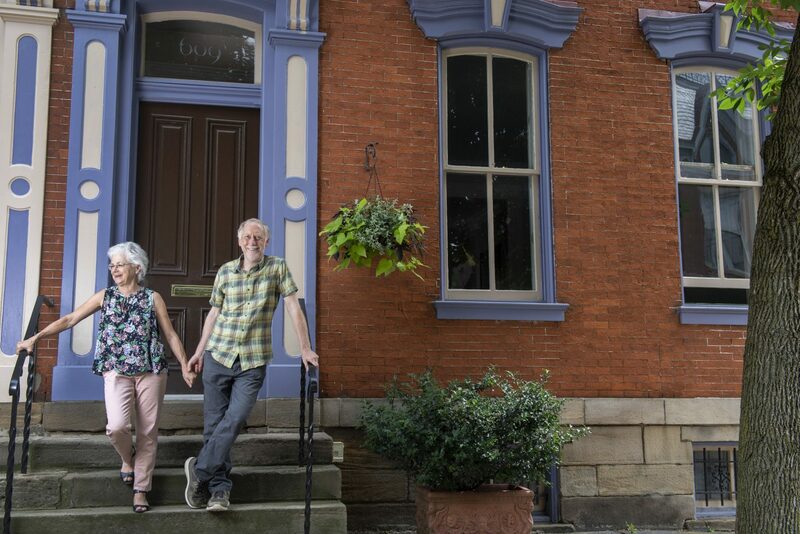 Clare and Duncan Horner, standing outside their house at 609 Taylor Avenue, in the Mexican War Streets on the North Side of Pittsburgh. When Clare and Duncan Horner met in England in the early 1970s, Clare was part of an exchange program in social history at Warwick University through the University of Pittsburgh. Duncan was also a Warwick University student and former apprentice compositor who had attended Ruskin College in Oxford. They both discovered that they had an interest in old buildings and architecture. “The old appealed to me,” said Clare. Duncan grew up in the eastern suburbs of London. Clare and Duncan married in 1973 and moved to Pittsburgh, where Clare finished her Doctor of Philosophy degree in history. When they went looking for an apartment, they found one on Resaca Place in the Mexican War Streets on the North Side, in an old house built in the 1880s. The Pittsburgh History & Landmarks Foundation (PHLF) was just starting to renovate the area. After they were given a one-year lease, Duncan asked if he could do some renovating. The landlord agreed, so Duncan enlarged the windows in the back-dining room and repaired the uneven flooring. Soon, he became quite adept at renovation and neighbors started requesting his skills and services for their homes. When a row house around the corner at 609 Taylor Avenue became available—part of four row houses that PHLF had purchased, cleaned the surface, and protected windows with plywood— Duncan set up a meeting with Arthur Ziegler, president of PHLF, to negotiate a price for the house. The Horners secured a mortgage and Neighborhood Housing Services provided a loan to help with improvements on the house, which had a roof that had fallen-in on the back end of the house. While Duncan worked on the house, Clare completed her Ph.D. from the University of Pittsburgh, and went on to law school. Along the way, they had two daughters. By this time the house had gone from two-and-a-half stories (the top was an attic) to four stories, including a finished basement and a widened dormer on the attic to accommodate a deck, larger windows, and a door leading out to the deck. The summer of 1988 was an unusually hot one, with temperatures climbing to 100 degrees on several days. They started looking for a summer place which had a stream or a public pool nearby where the girls could swim and play and they could escape the heat. They found it in Greene County. Clare spotted a small for sale sign on some land off of the main road. There was a stream, a small bridge which had been built by the Works Progress Administration during WWII, and a state park with a swimming pool that bordered on the property. The Horners signed a land sale contract (common in rural areas), which allowed them to pay a small monthly payment for three years, after which they had to pay the balance of the sale price. The property – homesteaded in 1834 and owned by a prominent local family, the Chesses – had a house, a milk shed, two barns (grain and dairy), a chicken coup, root cellar, outhouse and a smoke house. Clare and Duncan removed several of the outbuildings and made one building into a playhouse for their girls. Since the Chess family had owned the property for 100 years, Helen Chess Levander, the last of the Chesses to own the property, received a Pennsylvania century form, a certificate issued by the Commonwealth of Pennsylvania. The Chess family gave 30 acres to the state park in 1960, but their family cemetery is still on the park land. One of Helen’s nephews still lives across the road from Clare and Duncan. In 2004, the Horners attended a special presentation at the Heinz Architectural Center, where Jack Miller, then director of gift planning at PHLF, spoke about saving historic farms through creative planned gift strategies. 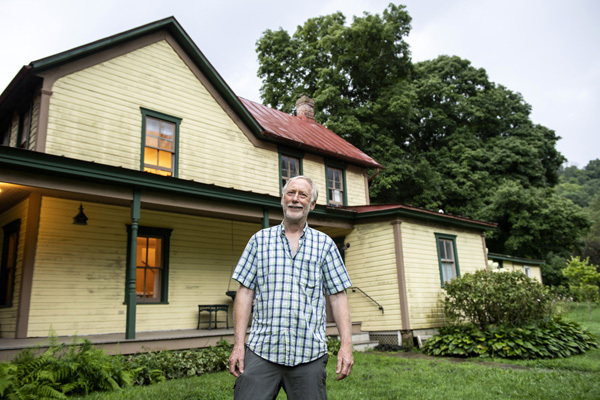 Duncan Horner seen here at their 1800s-era farmhouse located on 70-acres of land protected through a preservation easement donated to PHLF. As a result, in 2006, the Horners sold PHLF a preservation easement on their mid-19th-century, 70-acre farm and then re-financed the property to make a tax-deductible gift to PHLF to endow the easement. An easement is a voluntary legal agreement that is recorded in the local recorder of deeds office and, once established, binds both the current owners and all future owners. PHLF inspects its preservation easements on at least an annual basis and has a responsibility to defend and enforce the preservation easement as may be necessary. 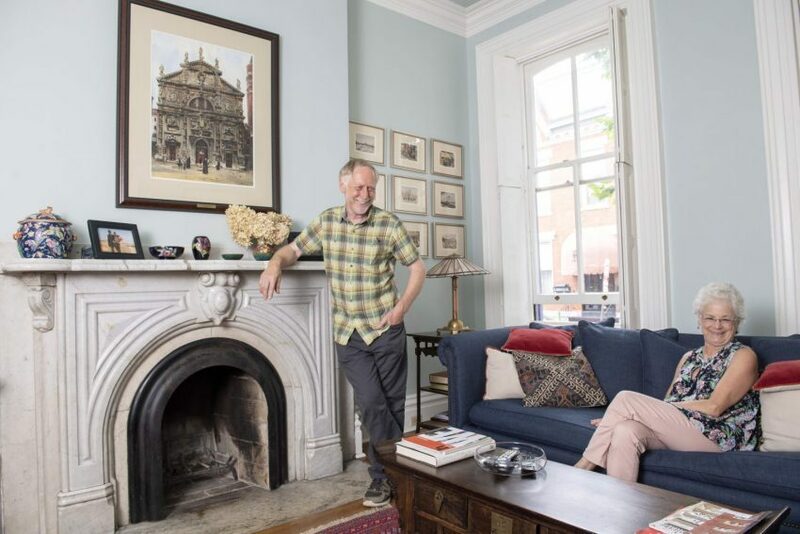 Over the years, the couple bought five other homes in the Mexican War Streets Historic District, four of which they rented out. They received awards from the City of Pittsburgh for two of their restorations. They have since sold all but one house in the Mexican War Streets; that house is owned by one of their daughters. Both the Horners’ daughters are interested in historic preservation. “The preservation tradition goes on,” said Clare.